The strain teaching has on your voice is something that is not widely addressed in the community, although the detriments are very real. About 58 percent of teachers develop a voice disorder in their lifetime, and the same can be said for speakers and presenters who spend long hours flexing their voice box. While there can’t always be a PA system in the classroom, one solution is to bring the microphone with you. A small, portable voice amplifier along with a microphone headset provides much-needed relief at a minimal cost. We reviewed 3 of the best portable voice amplifiers that are all under $40. When considering voice amplifiers for the classroom, battery life is one of the key considerations. Class after class, with very little breaks in between makes longevity a necessity. While the specs online list the Croove as 10 hours a charge, anecdotal evidence online suggests it can last much longer! Some users state that the Croove lasted almost a week without a charge, with one review stating that it lasted a month with daily use of 4 hours. That’s 80+ hours of battery life! Alongside battery life, longevity is also important in teaching tools. While some companies don’t supply replacement parts for their products and require purchasing a completely new model, Croove has replacement parts available for every accessory that accompanies the amplifier. Next time you accidentally spill your coffee, you can replace any parts worry-free! If your classroom or presentation tends to do a lot of movement and dancing, this may not be the microphone for you because of the looseness of the headset and potential need for readjustment. The WinBridge is the most economic voice amplifier on the list – and it doesn’t sacrifice quality. It includes almost all the accessories as the Croove and more flexibility. Not only does it have an MP3 aux port where you could plug in music to play for the class, it also has a TF card port and USB port as well. The WinBridge headset is also a standout among the three voice amplifiers; it is made of rubber instead of metal and is much more comfortable for extended periods on time. It seems to have been designed for someone more mobile when giving a presentation - perfect for the classroom! The built-in clip on the amplifier attaches securely and gives you the freedom to move around the classroom without encumbering your movement like a belt would. The wear-ability of this portable amplifier is a standout between the three. The WinBridge does not include a wall charger. It charges via USB, which means you’ll need to charge via your laptop, or use a USB wall adapter included with most smartphones. The battery is also the weakest on this list. It has 5-8 hours of charge with MP3 playing and only 3-8 hours with prolonged microphone use. Beware of the microphone usage draining the battery, especially if you tend to use higher volume settings in a noisy class! You may just look down and find you're out of battery before the end of the day. The Zoweetek is perfect if you want the affordability of the WinBridge with just a little more. The most notable difference is the battery life: With up to 12 hours of battery life, it blows the WinBridge out of the water! It has the TF port, the MP3 aux port and the USB port like the WinBridge. It includes a belt as well as a clip-on built into the speaker which gives you many options to secure the amplifier onto your body, another edge it definitely has over the Croove. 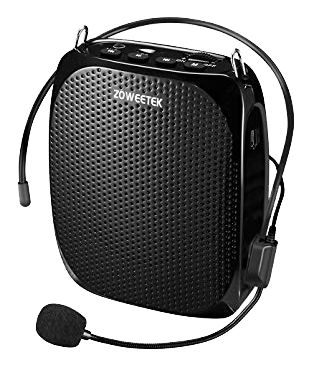 Considering the pros of the Zoweetek compared to the others, there are very few drawbacks to this portable amplifier. However, one thing to consider about the sound of this amplifier (and small portable amplifiers in general) is that the sound is tinnier and thinner than that of larger amplifiers. This isn’t too much of a concern if you are primarily talking and singing but this might be a deal breaker if you’re a baritone or bass or rely heavily on playing music from your amplifier. The lows won’t cut through as well and if you really wanted to crank the bass this may damage the speaker or leave you wanting more. For general use in the classroom, however, the Zoweetek will function perfectly. 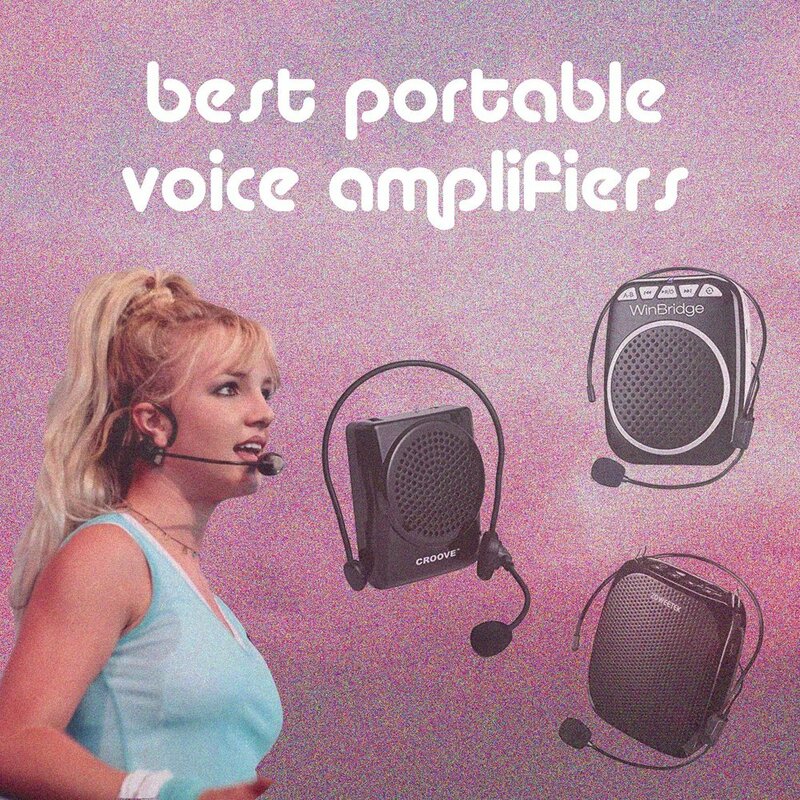 It’s a mixed bag when choosing a portable voice amplifier. If you’re looking for a model that will last you a long time, look no further than the Croove. If you’re looking for a more economic option, the WinBridge is a great quality for its price. The Zoweetek voice amplifier is perfect if you want the affordability of the WinBridge with just a little bit more.